Custom Mold & Design (CMD) prides itself in overcoming the challenges created by complex geometric parts and achieving tight tolerances in medical injection-molding applications. The Minneapolis, Minn., company works primarily with medical-device manufacturers, but it also partners with a variety of other industries on fully integrated molding solutions, from the design phase to part production. CMD has a reputation for its expertise in producing molds that are fully interchangeable and that support many molding processes, types and sizes. In other words, these are not your everyday molds. 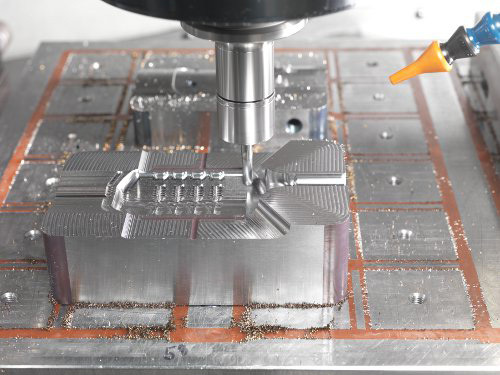 As customers increasingly demanded micro and nano capabilities, the company sought to shorten its lead-times and to produce tighter tolerances with higher-quality surface finishes. These vertical machining centers were acquired to bring high-performance capabilities to CMD’s mold production, making the company more precise, productive and profitable. The V33i’s 30,000-rpm core-cooled spindle helps bring additional accuracy to the company’s medical injection-molding applications, producing the tight tolerances and finishes that CMD requires. In hard milling applications that use 60-HRC materials, it is maintaining accuracies of plus or minus 0.0001 inch or less. The machine also has the rigidity and repeatability to maintain a process capability of 1.33 or better in critical dimensions. The company pushes as much graphite work as possible through the V22 machine and is enjoying additional accuracy while completing its jobs 20 to 30 percent faster. A robotic system also keeps the machine fed after-hours, which is another way to help lower costs.